The Scrum framework is driven by the goal of delivering maximum business value in a minimum time span. One of the most effective tools for delivering the greatest value in the shortest amount of time is prioritization. Prioritizing can be defined as determining the order and separating what must be done now, from what needs to be done later. 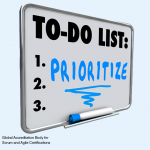 The concept of prioritization is not new to project management. The traditional Waterfall model of project management proposes using multiple task prioritization tools. From the Project Manager’s point of view, prioritization is integral because certain tasks must be accomplished first to expedite the development process and achieve the project goals. Some of the traditional techniques of task prioritization include setting deadlines for delegated tasks and using prioritization matrices. 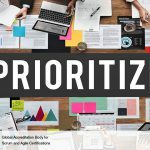 Scrum, however, uses Value-based Prioritization as one of the core principles that drives the structure and functionality of the entire Scrum framework—it helps projects benefit through adaptability and iterative development of the product or service. More significantly, Scrum aims at delivering a valuable product or service to the customer on an early and continuous basis. 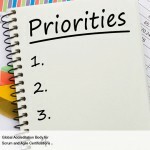 Prioritization is done by the Product Owner when he or she prioritizes User Stories in the Prioritized Product Backlog. The Prioritized Product Backlog contains a list of all the requirements needed to bring the project to fruition. Once the Product Owner has received the business requirements from the customer and written these down in the form of workable User Stories, he or she works with the customer and sponsor to understand which business requirements provide maximum business value. The Product Owner must understand what the customer wants and values in order to arrange the Prioritized Product Backlog Items (User Stories) by relative importance. Sometimes, a customer may mandate all User Stories to be of high priority. While this might be true, even a list of high-priority User Stories needs to be prioritized within the list itself. Prioritizing a backlog involves determining the criticality of each User Story. High-value requirements are identified and moved to the top of the Prioritized Product Backlog. The processes in which the principle of Value-based Prioritization is put into practice are Create Prioritized Product Backlog and Groom Prioritized Product Backlog. Simultaneously, the Product Owner must work with the Scrum Team to understand the project risks and uncertainty as they may have negative consequences associated with them. This should be taken into account while prioritizing User Stories on a value-based approach (refer to the Risk chapter for more information). The Scrum Team also alerts the Product Owner of any dependencies that arise out of implementation. These dependencies must be taken into account during prioritization. Prioritization may be based on a subjective estimate of the projected business value or profitability, or it can be based on results and analysis of the market using tools including, but not limited to, customer interviews, surveys, and financial models and analytical techniques. The Product Owner has to translate the inputs and needs of the project stakeholders to create the Prioritized Product Backlog. Hence, Value, Risk or uncertainty and Dependencies are the three factors considered while prioritizing the User Stories in the Prioritized Product Backlog. Thus prioritization results in deliverables that satisfies the requirements of the customer with the objective of delivering the maximum business value in the least amount of time. How can you deliver maximum business value in a minimum time span? Hi there! I could have sworn I’ve been to this blog before but after browsing through some of the articles I realized it’s new to me. Anyhow, I’m definitely happy I found it and I’ll be book-marking it and checking back frequently! It’s a shame you don’t possess a donate button! I’d certainly donate to the outstanding blog! definately will discuss this website with my Facebook group.